There are loads of choices for shops at OR Tambo Airport. The same goes for OR Tambo Airport restaurants. Passengers who are waiting for their flights have plenty to choose from to pass their time or to get in a meal. The airport is also open to the public, and makes a good day outing to introduce kids to the world of aviation or take in the landings/take-offs of planes on the runway from one of the 2 viewing decks in the terminal buildings. The following is a list of categories of what can be found at OR Tambo International Airport shops. African Origins, Out of Africa and Indaba Lifestyle can be visited for some local arts and craft. 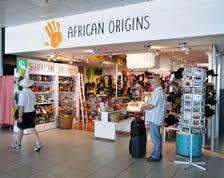 These stores can be visited when leaving the OR Tambo International Airport for gifts and remembrances with a uniquely African theme. Stores not only include portraits and sculptures but home-ware and clothing with an African theme. OR Tambo International Airport shops to go to for electronics and technology products include Capi, MTN and Vodacom. These stores are where passengers can go if they need any last minute electronic items before they depart from the OR Tambo Airport. Here passengers will get chargers, Bluetooth devices, batteries or USB sticks. Contract or prepaid cell phones can also be organized in some of the electronic stores. The banking institutions with branches at the OR Tambo Airport are Standard Bank, First National Bank, Nedbank, ABSA, and African Bank, equipped to take care of all banking issues. There are also ATM’s situated at all terminals if any visitors to the airport needs access to cash. Forex options include Bidvest Bank, Master Currency and Travelex. 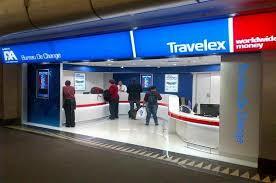 All currency exchange can safely be done at these stores right at the airport before leaving on an overseas trip. 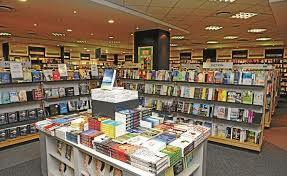 CNA and Exclusive Books are the shops at OR Tambo Airport to go to for stocking up on stationery for a trip or for the latest books to read during a long flight. They stock a wide range of books and current magazines, with something for everyone from kiddies and fiction to non-fiction. Cards, stationery items, games, toys are just some of the other areas stocked at these stores as well. nd the choice of stores leave passengers spoilt for choice. Department stores include Woolworths and the Big Five Duty Free stores. Woolworths is a major retail clothing store in South Africa with a well-known food section which has an emphasis on stocking local organic quality food. Sunglass Hut has stores and kiosks at the OR Tambo Airport terminals. Their range is for men, women and children with polarized and different frame shape options. 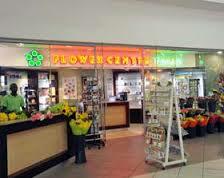 The Flower Centre Florist is the OR Tambo Airport shop for flowers. Flowers make a great welcome home gesture and if you would be picking someone up from the airport, a quick visit to the Flower Centre Florist will allow you to be waiting with a beautiful welcome home bouquet at the arrivals terminal. OR Tambo Airport restaurants include both sit down or take away joints. OR Tambo Airport restaurants which can be visited for a sit down meal are Nandos, Byte, Capello, Europa, Mugg and Bean, Ocean Basket, Spur and Wimpy. OR Tambo restaurants which can be visited for an on the go snack are Cosmic Candy, Biltong on the Go and Haagen Dazs. Here passengers and visitors to the airport can get quick snacks of salty biltong, sugary delights and even an icy treat. OR Tambo restaurants which serve up take away meals include Anat, Illy Cafe, Kauai and KFC. Meals from the take out OR Tambo restaurants can be enjoyed at the viewing deck while taking in sights of aircraft activity on the runways. Capital Shoes is the shoe store situated at the OR Tambo International Airport. This well stocked store features a shoe range for men and women from unbranded to some by many famous designers. In addition they also stock wallets, handbags and belts. Shops at OR Tambo Airport in this category include The Body Shop, Link Pharmacy and the Letsema Xpress Spa. The spa offers many relaxing treatments to unwind after a long flight or to relax the body in anticipation of a flight ahead. The Body Shop is a renowned store offering beauty and skin products with an emphasis on naturalness. Link Pharmacy is a brand name pharmacy in South Africa with over 200 branches countrywide. The OR Tambo branch is dedicated to providing advice and medicines. Carol Boyes has a presence at the OR Tambo Airport. The store is synonymous with high end house and lifestyle items. Pieces from the Carol Boyes range are often described as being collectible items. 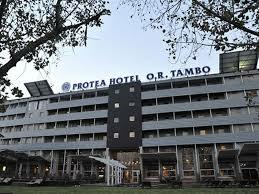 The Protea Hotel and City Lodge have a base at the OR Tambo Airport. 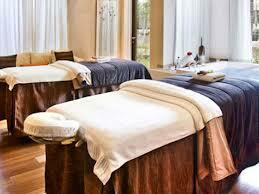 Overnight rooms can be booked for transient travellers who do not have a visa for South Africa. Since the hotel is located on airport property, they will not have to deal with immigration and still get a comfortable nights rest. The hotel can also be used for travellers who only need a room for the night and want to be as close as possible to the airport. Hotel guests will have access to restaurants and duty free stores right there at the airport in which the hotel is based in. The hotels also have internet connectivity, gym, swimming pool and laundry services. OR Tambo International Airport shops in this category include Accessorize, Browns, Mont Blanc and The Diamond Works Duty Free. Passengers can indulge in jewellery at duty free prices at these shops at OR Tambo Airport.